Leawo AVCHD Converter lets you convert AVCHD videos to enjoy anywhere. This AVCHD video converter is developed to convert AVCHD video to various formats, like AVI, MP4, WMV, MPG, MOV, FLV, RMVB, etc. Leawo AVCHD Converter provides perfect support for AVCHD videos, H.264/MPEG4 AVC videos and JVC recorded videos with advanced hardware acceleration to provide high speed conversion. ...... monitor display, add image and text watermarks and change video brightness, contrast and saturation. More conversion settings are available like video bit rate, frame rate, audio channel, etc. for professional output.? - Convert AVCHD videos to various formats: AVI, MP4, FLV, 3GP, MOV, MPG, MKV, VOB, etc. - Enable AVCHD to play on various portable devices: iPod, iPhone, PSP, Zune, Xbox, etc. - Tweak conversion settings: bit rate, frame rate, aspect ratio, etc. - Capture video image and save to BMP, JPG or PNG format. - Make video display better: brightness, contrast and audio volume. - Change video size to fit screen: 4:3, 16:9, pan & scan, etc. Qweas is providing links to Leawo AVCHD Converter 3.0 as a courtesy, and makes no representations regarding Leawo AVCHD Converter or any other applications or any information related thereto. Any questions, complaints or claims regarding this application Leawo AVCHD Converter 3.0 must be directed to the appropriate software vendor. 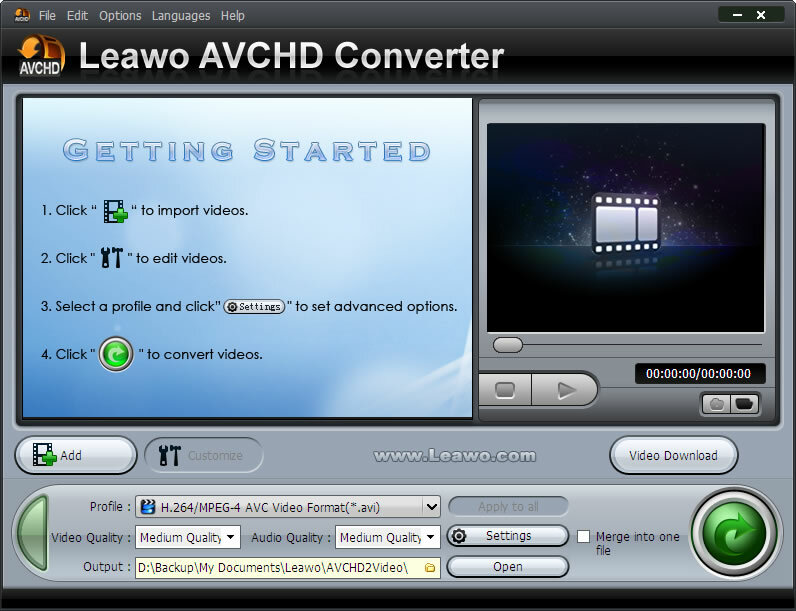 You may click the publisher link of Leawo AVCHD Converter on the top of this page to get more details about the vendor.